Spring has Sprung! Book you April & May vacation! Fabulous log home, which is nestled in 56 acres on the edge of the woods, Spectacular views of the Mountains! This 4 season 'Hideaway' Log Cabin Is the perfect 'retreat' for family, friends or as a Romantic getaway. WIFI,Open floor plan with 3 bedrooms, 2 1/2 baths. Fireplace, hammock. Game Room with Pool table, Hockey table etc.. Home Movie Theater with 61 inch HD TV and surround sound 100 DVDs. super beds to sleep on, with wonderful bedding. 1 king, 2 queens, 2 twins and 1 queen pull out couch. Cosy down comforters 4 pillows on each bed. Full kitchen, oven, microwave, dishwasher Full frig. Internet,games & books. High chair & pack & play for infants. 8 foot wide porches, spectacular sunsets. Charcoal Grill, extra TV, 50 Free VHS tapes. 6 rocking chairs on Porches. Near Lake & Mountains with tons to do or just do nothing at all! 100 jet therapy Hot Tub, w/waterfall, Fun for all seasons! The covered patio area is really fabulous, air conditioning, Camp Fire ring with FREE firewood provided. Booking October is our Peak Fall seasons Close to Lake Champlain: We are 2 miles from Lake Champlain you can enjoy swimming, kayaking, canoeing, boating, jet skiing, water skiing and more! Take a sailboat tour or a dinner cruise! We have lots of hiking all around us. The cabin itself sits on 56 private acres of its own for you to have a fun and or romantic picnic with your loved ones! Walks etc... We even provide the wicker picnic basket. Relax on the Hammock for 2 on our huge wrap around porch! In addition, We now Host special events on this beautiful property! Summer is Peak time here in the green mountain state, you and your family will enjoy your stay here while at the same time doing what you want in a beautiful place. Fully equipped, family friendly also great for the grandparents. We have provided Games for the children and Adults alike and a Basket of pamphlets for you to browse and decide what you'll do for your stay here in Vermont. For guests with children, we offer the opportunity to visit a real Vermont Dairy Farm where they can go see hundreds of cows, visit the baby calves, horses, rabbits, cats, dogs, and puppies. Should they wish, they can see the cows milked too! This farm is the Real thing... Not a tourist attraction -- only available to our guests upon request. come see a REAL Vermont Dairy Farm, Tours are available for our guests only enjoy seeing how the cows are milked, and the whole farm system is worked.! Real Farm tour of a working farm with over 500 cows and calves. My husband and built this cabin for our son whose story you will read about at the cabin. We have been renting for 17 years, And as parents of 5 children and grandparents of 11, we understand what families need and love! We also have a larger home to accommodate 2 or more families about 25 minutes from Jordan's cabin just in the mountains in Ripton Vermont. River Stone Lodge. We take every effort to provide you with privacy but we really try to give you a place of relaxation and fun for families in either home. 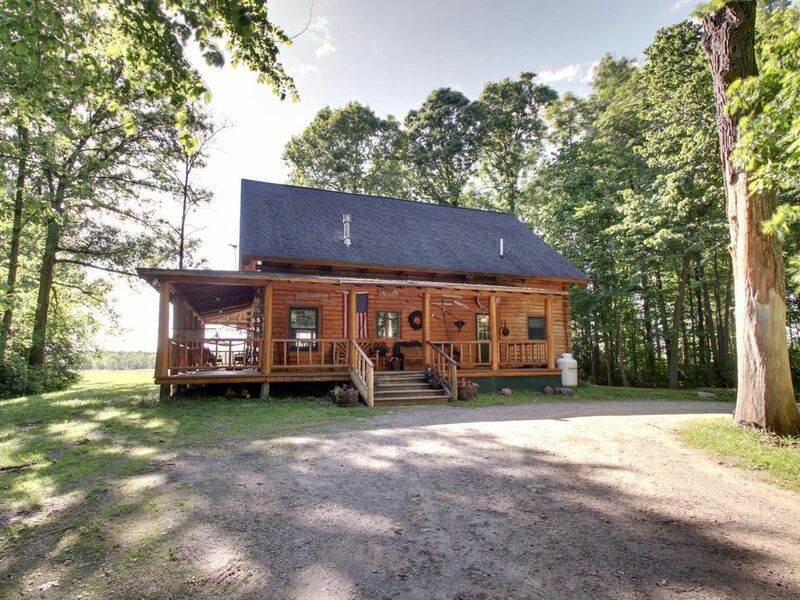 This log cabin property is really very special, you have beautiful views with spectacular sunsets, it is great for your family to relax and enjoy the peaceful setting yet close enough to Burlington/Middlebury for shopping and events. Enjoy grilling outside while the kids have a blast around the campfire all seasons of the year. We love sitting in the hot tub as the sun goes down with a great cup of coffee. Many guests love the outdoor wraparound porch which extends the living area for 3 seasons, Have drinks, play games or just visit. We are a 4 season rental and in any season you will love the cabin. We have many unique benefits, A wrap around porch that is wonderful for enjoying the lovely days 3 seasons of the year with several rockers, a swing, and table with a couch for playing cards, having your favourite coffee or a good drink! How about enjoying our hot tub while watching the sun go down or early in the morning while others sleep. A campfire ring to have campfire roasting marshmallows and singing campfires songs around. We provide the wood. The game room with full-size pool table and full-size air hockey! The home movie theatre where you can have down time watching movies. There is so much for everyone from couples to families. All bathrooms come fully equipped with towels and are nicely sized. All bathrooms include all towels and basic amenities. We clean everything from top to bottom between renters. Bathroom off sleigh bedroom is handicapped equipped with a seat in the shower and wide opening. The master suite bathroom upstairs has a separate shower from the Old fashioned claw foot bath tub and double sink area, nice and large with good lighting . We provide starter amenities such as hand soap, body soap, laundry soap, dish detergent and other. New all bedding has been upgraded for queen beds with luxury bedding such as you would find in a luxury hotel. Our guests are saying 'fabulous!' so comfortable, we did not want to leave our bed. Lake Champlain is 2 miles from the cabin in both directions! Closer still is a wild life area just down the rode where you can fish. radiant heated floors so WONDERFUL! Full size seats 8 with waterfalls, jets, colored led lighting . We had a wonderful time at this cozy cabin. The photos don't really do it justice. It is adorable. Everything was clean and in good working condition. Hot tub, game room, fire pit, lots of sitting areas, large dinner table, comfortable beds. We would certainly come back again. The only thing to note is that there is no real privacy as it is an open floor plan and you can easily hear conversations between the floors. But, if you are with family as we were, it really doesn't matter. Also, very good dining in the nearby town of Vergennes. We loved this cabin in Vermont! Unique, cozy and comfortable. We had a great time. This is a authentic log cabin with modern amenities. Charming home in a beautiful environment. Highly recommend! Thank you so MUCH! We built this cabin and wanted the Authentic Log cabin logs and we are glad you loved it! All with of course making sure you have updated amenities. We hope you visit us again! The place was perfect - cozy and authentic. Great escape from NYC. Highly Recommend. Thank you so much! We hope you come again to enjoy a different season with us to! Awesome! Many family memories made! Thanks so much for staying with us! We are glad you had a great time and look forward to your return. The dishwasher is fairly new so I will have that checked :) And there was a knife sharpener in the kitchen I am so sorry you did not see it. This gives me the idea to post a note somewhere so folks find it. WIFI does work well it just depends on the weather and if they are servicing it somewhere sometimes all you have to do is reset it, It is something we can't control the WIFI company but we make every effort to make sure it is working. See you in the future! Great house made for fun. We had a great time and the house was super unique and very comfortable. We moved right in and made ourselves at home. We all really loved this house so much. It’s just beautiful. The photos don’t do it justice. The hot tub was clean, the firepit was cool and we had lots of fun in the game room and chilled out watching movies. There were 8 of us and we all had plenty of room. Only negatives I have to add are that there is basically no privacy in the house because you can hear everything from any room. This is largely due to the loft set up but the loft was also super cool so we tried not to mind. Just kind of weird to hear people talking crisp and clear when you’re in the bathroom haha. I was there with close family and friends so it didn’t bother us to much except during the morning when some wanted to sleep in and others were already up. Also there was some seriously treacherous ice directly in front of the house and on the steps so we couldn’t avoid it going in and out. We went out and bought salt for it but it didn’t help much. 5 out of the 8 of us slipped and one of our group really hurt her back as we were packing the cars to leave. The property was well maintained otherwise and we had what we needed. The basics were provided and plenty of sheets and towels. This property was exactly what we were looking for. The house was immaculately clean when we walked in. All the rooms were perfect and anything we needed in the kitchen was available. The outside property was also gorgeous. There was plenty space for the kids to run around both in the front yard and back. My son had a great time exploring the corn field for left over corn. The downtown area is closeby and it had so many great spots for dinners. Burlington is about 15 mins away. We will definitely return. I highly recommend this house. Resort amenities in your own log cabin vacation home! private Log Cabin! 4 floors of Fun! Enjoy a large 61 inch screen in your own personal movie theater for family, friends or just a romantic getaway! In addition we have a game room with pool table, air hockey, and so much more! Book your stay and have it all in one place. Great Camp fire ring for sitting around the roaring campfire ring. Hammock for relaxing. Summer time is Spectacular! Lovely views, great weather not to hot not to cold. Gentle breezes with the best sunsets you'll see anywhere! Come swim, water ski, horse back ride, hike, canoe, kayak just about everything you can think of we have. see it all from this central location. You won't want to miss our beautiful Vermont foliage! Fall is truly Fabulous in the green mountain state... Beautiful weather, Gorgeous foliage and romantic sunsets. Winter time in Vermont is truly a winter wonderland, come ski, snowboard, sled, ice skate, ice fish or just relax. Golf: Golf is just minutes away in different directions. We are also close to UVM and Middlebury Colleges many parents have stayed with us from these colleges, We can also arrange for graduations parties for college students upon request. Please make arrangements in advance of arriving. We also offer Trail rides on a first come basis as horses are limited to 2 trail rides a day. Trail rides are meant for all levels of riders please inquire before your arrival. Ski: Please contact us today for your next stay here in Vermont! Cross country ski out your back door or down hill ski at 5 major ski areas Bolton Valley, Smuggs, Stowe, Middlebury Snowbowl, Sugar bush, White Face all with 30 minutes to 70 minutes from the Log Cabin. Sled down local hills 2 sleds provided for the children, Extra can be purchased locally.